I hope you had a great weekend? I had an amazing one, I shared some short videos and photos on Insta stories. If you are on Instagram, follow me my handle is @titispassion. I am starting the week with in a Velvet dress perfect for a Holiday party. Velvet made a major comeback this Fall, I wore a velvet bodysuit on a previous post here. I was itching to try this trend in a dress, so when I found this off shoulder gorgeous dress by Asos, I had to share with it you. This dress would be perfect for a special occasion during the holidays. I love the sweetheart neckline, ruffles and high split detail. I would recommend sizing down on this dress, it runs a little big. It is unfortunately only available in one size now but I am sure Asos would restock it soon. I have also linked other stylish velvet dresses below. I am wearing an old pair of earrings from Zara. I am wearing the Bristol 26mm watch by Daniel Wellington. You can save 15% off with code TITISPASSION. My clutch by Rebecca Minkoff is available is different colors and currently available for 30% off. 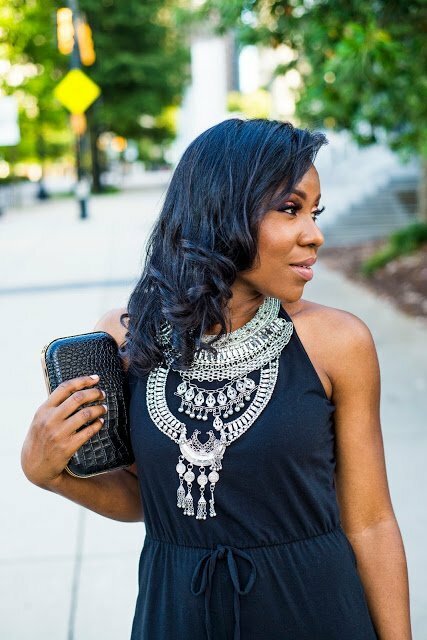 When you are wearing a strapless dress, opt for statement earrings versus any form of neck jewelry. That dress is beautiful and I love the color.